Paleo and Diabetes – Amazing facts! I absolutely love to read cookbooks from front to back as well as books on nutrition, but I seldom get to read both in one book that is entertaining and enlightening and full of amazing facts all the way to its end. The Paleo Diabetes Diet Solution is a rare book – so well put-together, well-researched, and well-detailed that from the middle of the second chapter I already knew that this was something I had to share with everyone! The book’s first 28 pages go into very interesting facts about the body and diabetes in a way that anyone can understand. They cover all the how-tos and whys, including detailed information about blood tests, how to read them, which to ask for, which to address with your doctor or nutritionist, and other helpful points for anyone – diabetic or not! After that comes the subject of the paleo diet and how it applies to one’s physiology, which leads to an even more exciting chapter for me, “Beyond Food – Other things to Consider,” which aligns totally with my beliefs, how I live, and what I promote. This chapter alone was not only on the mark, but filled with information that is vital to one’s well-being. I truly mean VITAL! This chapter is also key because it can help ensure a high quality of life by showing you what you can do now this very moment to take action and start reaping benefits. It can be daunting to prepare for and start a diet, especially when it comes to eating out and juggling all the required lifestyle changes. It’s no surprise that many people never even get past “Go.” The authors, Jill Hillhouse and Lisa Cantkier, walk you through this book holding your hand, educating you at every step of the way to the end of showing you how to apply the information to ensure your success. This book is not just another nutrition book or healthy cookbook – not at all – for this very reason: The information is written to be applied. They WANT you to live that healthy, active life we all yearn for, no matter how far away or hopeless that goal may seem. They wrote this book to change lives. 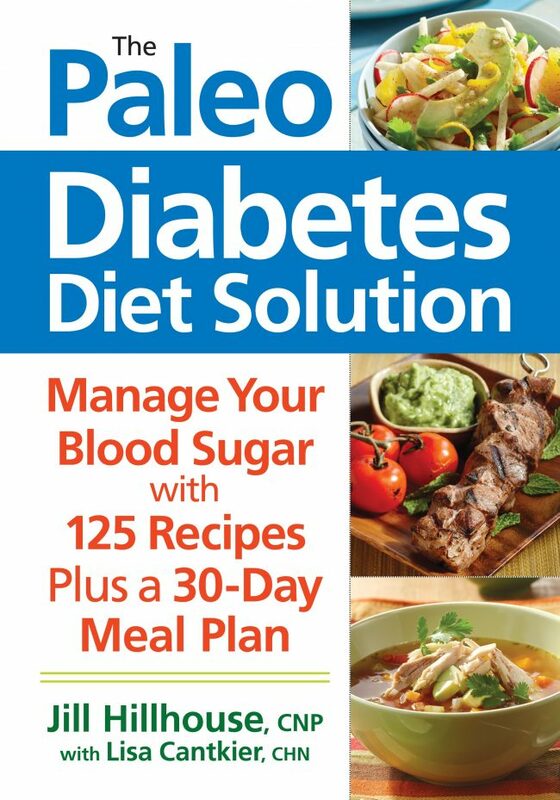 The book has useable charts, directions for how and when and why to use “the correct” glucose meters, a wonderful 30-day Meal Plan with easy references to recipes, and over 150 paleo recipes designed to maintain a healthy blood sugar level. This is not a cookbook with recipes full of yummy honey, maple syrup, ice cream, and nut flours to satisfy your sweet tooth; it’s designed for you to gain an understanding of and control over your blood sugar, which is, frankly, important for us all. It could be a sorry life ahead for anyone who puts off getting control for another week or who waits until another Monday, or until after the holidays – or ignores their diet altogether. This book is like having two wonderful, caring friends by your side opening your eyes, guiding you along, and cooking with you – then passing the torch of knowledge over to you, so you can continue to grow and learn. More and more research is sure to be released in the coming years, and this nutrition-cookbook will serve as a solid foundation as you further expand your knowledge. Tina – thank you so much for a great review of our book! Our goal was to explain things in a way that everyone could understand while not scrimping on the science. I am so glad you liked it and that it resonated with you! You are very, very welcome! I feel very passionate about this subject and I feel that this book is truly one of a kind.